Creating a 21-mile (33.8 kilometers) long park system that encompasses more than 3,800 acres (1538 hectares) is no small task. But that’s just what 21st Century Parks set out to do in 2010. The Parklands is an extensive new park system in the Louisville, Kentucky area that will include four major parks linked by a park drive, a world class urban trail system and a remarkable water trail, all tracing Floyds Fork, a classic Kentucky stream. These walls were installed in just 6 weeks. “Compared to typical MSE walls we’ve installed for interstates, there’s less labor involved with Redi-Rock. It certainly is easy to install,” explained the foreman at MAC Construction who performed the installation. “To save on backfill materials and geogrid we decided to make the wall a gravity wall for all sections possible. I did not have any issues with transitioning the wall from a reinforced section to a gravity section. For tall walls where the opportunity exists and other systems add layers of geogrid to meet connection capacity, I would recommend the Redi-Rock Positive Connection block in the future,” Derichs said. Aesthetics were also important for the Parklands, since this is a park setting and a popular bike path at the base of the wall. “One of the main reasons we went with Redi-Rock was because of the Ledgestone series. From an architectural and aesthetic standpoint, it blended well with the park setting,” he said. Another unique aspect of this phase was a nearby gravity wall for the “Louisville Loop” portion of the park’s bike path. 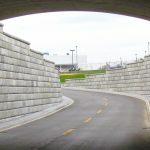 This portion of the bike path required a switchback, and the Redi-Rock Ledgestone wall was located at the outside of the curve. The wall included retaining wall blocks topped with freestanding blocks and caps. Designers chose Redi-Rock Limestone texture blocks for this phase to mimic the look of the existing block walls at Tyler Park in an historic part of downtown Louisville. “I think everyone is really happy with the way it looks,” Daley said. Limestone texture walls gave this massive wall an aesthetic finish. Soft soils: “Almost 21,000 tons (19050 metric tons) of rock was installed behind this wall,” explained Irvin Vittitow, Co-owner and General Manager at Redi-Rock of Kentuckiana. Vertical wall face: “We had a vertical wall face that we had to accommodate which meant that we had to use the smaller knobs on the blocks in designing the Redi-Rock walls,” Hines explained. Large pipe penetrations that went through the wall structure: “We accommodated the 48 inch (1.2 meters) diameter and 36 inch (0.9 meter) diameter pipes with cast in place concrete headwalls that incorporated slip joints that went all the way to the top of the wall to minimize any potential detriment to the wall through differential settlement,” Hines said. This project was the co-recipient of the 2013 Rocky Award for “Commercial Wall of the Year” from Redi-Rock International. The Rocky Awards are an annual honor recognizing the best Redi-Rock projects completed each year across the world. Freestanding Blocks – Redi-Rock freestanding blocks are textured on both sides, giving above-grade walls an unbeatable, finished look for any project you design. 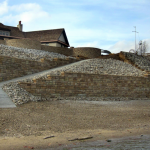 Ledgestone Blocks – Redi-Rock Ledgestone blocks give projects a random, stacked stone look.